Wild: Unlike many of the herd animals on the island, Ankylosaurus crassacutis tends to live in small family units. I believe they can afford to stick with smaller groups because of their incredibly thick skin for which they're named. Domesticated: Without a doubt, the best trait of a trained Ankylosaurus is its enormously dense tail. This tail is powerful enough to shatter the resource-laden rocks of the island. One of the wealthier human tribes on the island utilizes a squad of Ankylosaurus in its mines and quarries. 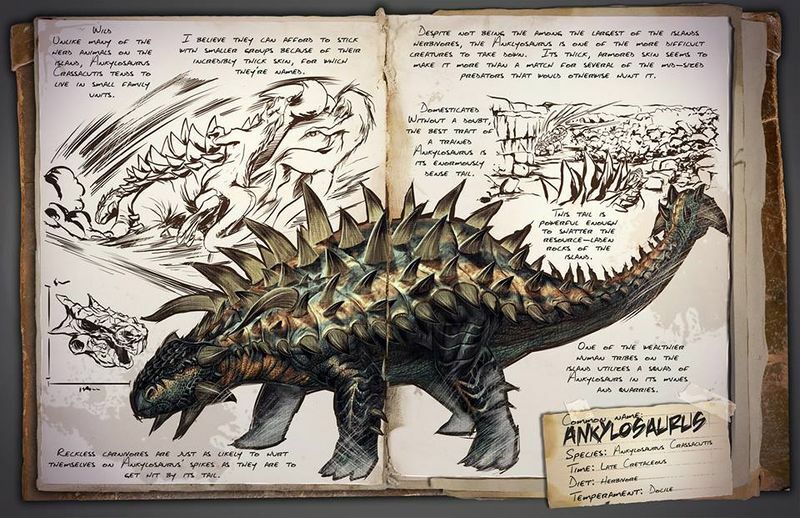 Known Information: Despite not being among the largest of the islands herbivores, the Ankylosaurus is one of the more difficult Creatures to take down. Its thick, armored skin seems to make it more than a match for several of the mid-sized predators that would otherwise hunt it. Reckless carnivores are just as likely to hurt themselves on Ankylosaurus' spikes as they are to get hit by its tail.